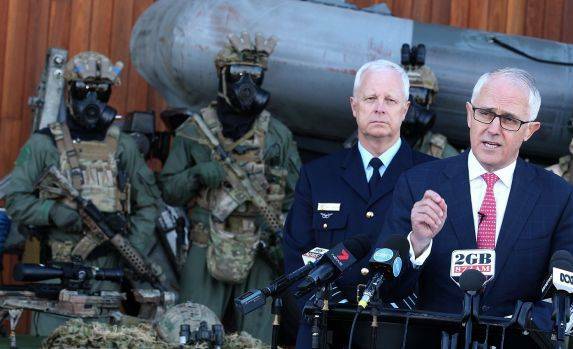 Australian Prime Minister Malcolm Turnbull, speaking about the billions of dollars of Australian taxpayers money he is investing into arms exports. “West Papuans are being shot and villages bombed because Indonesian law makes no distinction between ‘terrorism’ and ‘separatism’,” Grech explained at the West Papua Rent Collective Open Day at the Federal Republic of West Papua (FRWP) office in Docklands on August 5. Grech described how Australia is complicit in the continued dispossession of indigenous West Papuans: “Indonesia is the second biggest importer of Australian-made arms and other defence exports – and [Prime Minister] Malcolm Turnbull has just committed $3.8 billion of Australian taxpayers money so that Australia can become the tenth biggest arms exporter in the world”. Indigenous West Papuans are often the target of these imported arms. Australian Special Forces and Federal Police also assist Indonesian police, military and ‘anti-terrorist’ forces in their training. A “slow motion” genocide has been occurring in West Papua resulting in more than 500,000 “missing” indigenous people since 1963, when the United Nations officially handed the administration of West Papua to Indonesia. The West Papua Rent Collective is a group of Australians who are investing in West Papua’s future as an independent Melanesian state. Membership to the organisation helps pay the rent on the FRWP’s office in Docklands, undoubtedly to the annoyance of the Australian government that is bound by the Lombok Treaty to outlaw any display of West Papuan separatism or independence within its borders. Three times a year, Rent Collective ‘shareholders’ are treated to an informative talk, a delicious Dapur Sampari lunch and live music by The Neighbours, the office house band.